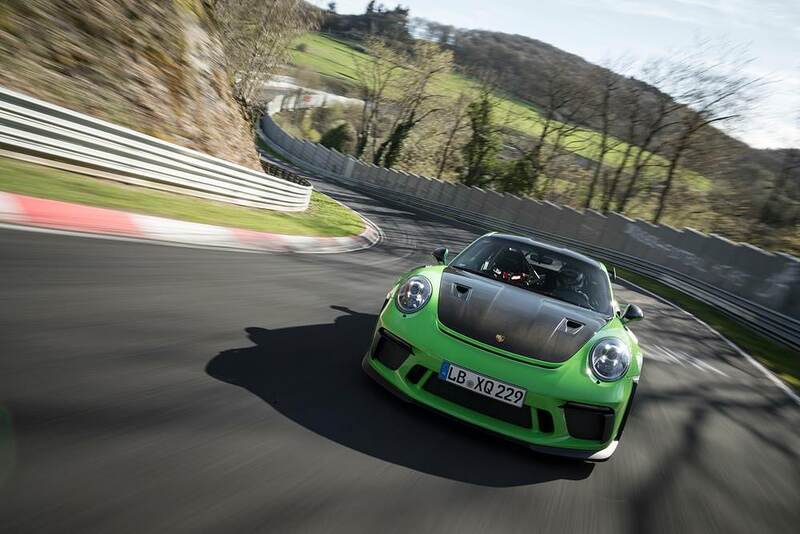 On April 16 the Porsche 911 GT3 RS set another benchmark for road-approved sports cars at the Nürburgring-Nordschleife circuit in Germany: Porsche works race driver Kévin Estre set a lap time in 6:56.4 minutes with the 520-hp GT3 RS. The Frenchman’s lap time was 24 seconds faster than the best time achieved with the previous GT3 RS model. Porsche development driver Lars Kern was sharing driving duties with Estre. Following the 918 Spyder and the 911 GT2 RS, the new GT3 RS is the third production Porsche sports car with a notarised lap time of less than seven minutes on the world’s most demanding race track, known as the ‘Green Hell’. As is customary for record drives, the time was measured around the 20.6-kilometre lap. The 911 GT3 RS with motorsport-bred chassis and 383-kW (520-hp), four-litre, high-speed naturally aspirated engine had its world premiere at the Geneva Motor Show in early March this year. The high-performance sports car accelerates from 0 to 100 km/h in 3.2 seconds, reaching a top speed of 312 km/h.